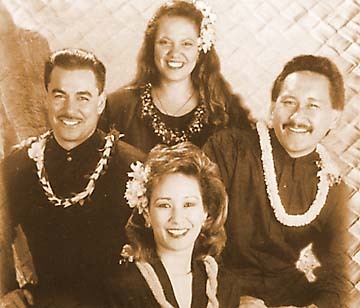 The 1999 Ka Himeni Ana music award went to Kanilau. Hawaiian music doesn't get any better, or more traditional, than when performed at the annual Ka Himeni Ana Hawaiian Song Contest. What makes this 20-year-old event special is that all of the contestants -- groups of between two and five singers -- will sing traditional nahenahe (soft, sweet) Hawaiian-language songs without electric amplification of voices or instruments. Other rules stipulate that at least half of the group must play an instrument, and the instruments must also be traditional, i.e. acoustic bass, autoharp, guitar, steel guitar (the only instrument which may be amplified), ukulele and any other instruments used by Hawaiians prior to 1778. No soloists are allowed. The Hawaii Theatre provides a perfect setting; the downtown hall was designed at a time when all performers worked without electrical amplification. The place is not only beautiful and historic, but the acoustics are superb as well. "I like to sit in the loges," Marge Hansen, co-founder of Ka Himeni Ana, said. "The acoustics at the Hawaii Theatre are just perfect. You can hear everything right up to the very last row." Eleven groups will be competing tomorrow night. Haunani Apoliona, Bill Kaiwa and Nina Kealiiwahamana will be back this year as judges and Uncle Keola Beamer (not to be confused with his nephew, slack-key master Keola Beamer) will be master of ceremonies. Last year's winning group, Ho'omalie, will open the program. Ka Himeni Ana also honors a composer or performer who has made a significant contribution to traditional Hawaiian music and this year's honoree is the late Lena Machado. THE IDEA for the unique contest came about in 1983, when Hansen and co-founder Richard M. Towill found the volume of the music prevented normal conversation during a company party. Hansen later mentioned that she and her husband had been at the Ilikai one night and enjoyed the unamplified music played by a group on the beach. Towill agreed that music doesn't have to be loud to be good, and decided, with his company, to sponsor a contest to encourage interest in traditional, unamplified Hawaiian music. Ka Himeni Ana was the result. It didn't get much public notice in the early years but the word-of-mouth response eventually resulted in bigger crowds than the original venue could handle. A two-night contest was considered but deemed too hard on the contestants and too time-intensive to be practical for the sponsors (Towill, his son Ricky, Hansen and the others who put on the contest each year are not professional concert promoters; they do it in addition to the other responsibilities of their day jobs). And the 1998 Ka Himeni Ana music winner was the quartet, 'Ale'a. Pictured from left, Chad Takatsugi, Kala'i Stern, Ryan Gonzales and Kale Hannahs. The contest moved to the Hawaii Theatre several years ago. A quick scan of the winners' list of previous contests confirms that Ka Himeni Ana is the place to see the next generation of Hawaiian music stars. Among previous winners are Pai'ea (1999), 'Ale'a (1998), Kanilau (1995) and the Kanele'a Connection (1993). Del Beazley, Chris Kamaka and Ku'uipo Kumukahi teamed up in 1998 to win as Kamaka, Beazley and Kumukahi. Beazley and Kumukahi went on to become Hoku Award-winners, as did 'Ale'a. Kamaka also won again later as a member of Kipona Leo Hawaii with William Ama Aarona, Manu Boyd and Horace K. Dudoit III, in 1986. 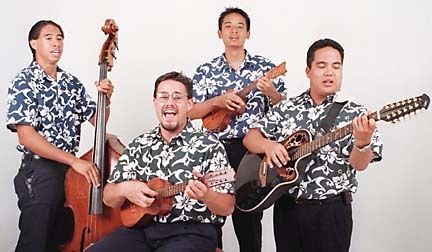 The group would change its name to Ho'okena and become a success in 1990. Hansen says that, after two decades, Ka Himeni Ana is still both a labor of love and "a lot of hard work." "We had no idea (it would last this long), and we learned an awful lot over the years," she said. "Traditional Hawaiian singing, that's what we're trying to encourage. It allows one to enjoy the music without amplification, and that's what we're striving for -- music without all that noise!"